MARS RETROGRADE 2016 – WHEN IS IT? During 2016, Mars retrograde period occurs during April 18th – June 29th. The affected degree areas in your horoscope are (in reverse order): 08 Sagittarius – 23 Scorpio. If you have planets or angles within this zone, the above period will have more significance to you. During the 2-year orbit of Mars, there is a period of several months where – observed nightly – Mars appears to be moving in reverse of his usual direction. This is called Mars retrograde period. If you were born during Mars retrograde period, you’ll see a little ‘Rx’ or just ‘r’ marking by your natal Mars symbol in your natal chart. In this article we’ll focus on transiting Mars retrograde, which will be significant regardless of your natal Mars being direct or retrograde. WHAT DOES MARS RETROGRADE MEAN IN YOUR HOROSCOPE? Transit or solar arc between Uranus and Pluto can mark a dynamic period of empowerment and individuation. Uranus intensifies Pluto’s need for deep transformation, and Pluto empowers Uranus’ need to be true to one’s self without worrying about what other people may think. Noel Tyl said Uranus Pluto transit is like Jesus walking into the temple and overturning the tables of moneychangers. There is a powerful sense of “this MUST change now!” that accompanies this transit. There may also be an upheaval that opens up hitherto unseen possibilities. Whether you experience it on an external or internal level, Uranus-Pluto transit could present an opportunity to make life-altering changes. What must change in your life right now? What have you tolerated too long? What change, if implemented now, would make you feel more alive and authentic? What have you been neglecting that is essential for your joy? Is approval from others worth neglecting yourself? Where does your passion lie? How can you bring it back into your work and relationships? As Uranus-Pluto transit nears exact conjunction, square or opposition, you may feel a pressure building in the form of upsets or discontent in any area of your life. This could be a warning signal showing you that the time to make the necessary change is now. But what if you don’t, and continue tolerating the intolerable situation? The tension and pressure might implode within the body, causing some health issues perhaps 1-2 years later. Under the force of Uranus-Pluto transit, it may be easier to find the courage to take a step of faith in a brand new direction. Afterward, you will most likely feel stronger and more attuned to your authentic self. Are you experiencing the Uranus-Pluto transit right now? How do you feel its pressure? Were you able to make the necessary changes? Feel free to share your thoughts and experience in the comment section. Venus represents your relationship needs. Neptune is often described by the word “Disillusionment.” Hence, Venus Neptune aspect is commonly thought of as “Disillusionment in Love” which sounds ominous. While disillusionment can be a difficult experience, it’s a necessary process that accelerates your healing toward having a healthier relationship with yourself and others. Here we’ll take a look at Venus Neptune conjunction, square or opposition in transit and in natal chart while specifically focusing on the disillusionment process. In your natal horoscope, Venus Neptune aspect suggests an overabundance of romantic and aesthetic needs. Like swooning to Rachmaninoff’s piano concerto, there seems to be a need for aesthetic or romantic intoxication, sometimes to the point of excess or even escapism. The question to ask is “Why does this need exist?” When did this need to escape into the ideal world of beauty and romance arise? Some clients with Venus conjunct, square or opposite Neptune might tell me “Oh I’ve had a good childhood – my father was very loving to us, he was a very good provider”, etc, even though it becomes clear later in the discussion that they hardly spent any time with one or both of their parents, and felt terribly abandoned by them. It’s the Neptunian idealization process at work in the context of relationship with their parents. The romantic and aesthetic imagination of Venus-Neptune aspect can easily form a defense mechanism against undesirable experience of rejection, criticism or abandonment. In its most extreme, Neptune-Venus aspect suggests denial of the fact that something painful was going on in your early relationship with your family. Such denial is a setup for later disillusionment, perhaps to be triggered by future Neptune transit to Venus or the 7th house ruler. Transit Neptune Conjunct Square Opposition Venus: Illusion or Inspiration? Neptune transit to Venus or the 7th house ruler tests your relationship to see if your idealized perception about your partner and the relationship is valid. If your perception was based on a fantasy created in your early childhood (see the above section on natal Venus Neptune conjunction, square or opposition), then you may be choosing to blind yourself to important signals that are telling you all is not as it seems in your relationship. Such signals may include the fact that your partner hardly spends any quality time with you, or that he/she has lied to you before, or that there seems to be a little too much alcohol or drugs involved whenever you’re together. If the relationship is indeed based on unreality (i.e. you turning a blind eye to unhealthy signals and ending up victimized as a result), then this transit will most likely dissolve the blinder you have on, creating an opportunity to release the pattern of idealization you’ve been holding onto since childhood. The most difficult part of transit Neptune Venus conjunction, square or opposition is to let go of the pattern of unrealistic idealization. In order to do so, you’ll need to let go of the defense mechanism you’ve created as a child (e.g. fantasizing the idealized relationship with the parent of opposite gender), thereby realizing (and feeling the emotions associated with) the truth about your early family life. The process of disillusionment has a purpose, and its pain is most likely a reminder of how you used to feel as a child, growing up in your home environment. If you are able to fully embrace the pain at its childhood root, the pain will dissolve and the stuck emotional energy, along with the pattern of denial, can be released. Many people with a strong Neptune aspect lose memory of their childhood, especially if it was painful. If you choose to escape again, even after the disillusionment, into the idealized perception of your life, then your pattern of denial will remain the same, and the disillusionment process will most likely have to repeat itself in the future. Lastly, your increased emotional energy may free up your creative capacity and aesthetic appreciation, so that you can enjoy more creativity, beauty and romance, all the while maintaining a healthy connection with reality. Here are some general guidelines for interpreting the meaning of planets progressed through the Solar Arc method. Since each “arc” will last for approximately 9 months (6 months applying, 3 months separating), we can add the faster moving planets and points to the interpretation. ASC or MC solar arcs tend to manifest as visible events in terms of the planet that they are aspecting. MC arc may suggest a vocationally significant development. For example, solar arc of MC making a hard aspect to Pluto (which is written as MC=Pluto) may suggest an empowerment in terms of career, or a status change within the family such as relocation, etc. Sun solar arc suggests “illumination” of self in terms of the planet aspected by it. Solar Arc Sun=Venus may be a time where love relationship is especially highlighted, or when an artistic project receives rewarding recognition, etc. Moon solar arc suggests the shift in emotional needs in terms of the aspected planets. Moon=Pluto may be a time when passion and zeal enters the heart; Moon=Jupiter may be when international interest opens up. Mercury solar arc potentially suggests development of an idea, communication, or travels. Venus solar arc may suggest development of love, relationship, arts, or pleasant dealing with the public. Mars solar arc can suggest a time when you make a stand, or assume additional responsibility and meet it successfully. Jupiter solar arc often suggests rewards, opportunity, and education. Saturn solar arc suggests change of gears, ambition moving forward, or some inevitable hardship that leads to maturity. Uranus solar arc suggests status change that may lead to greater individuation, freedom, or innovative change. Individuation may necessitate a separation from old relationship. Pluto solar arc suggests change that may lead to empowerment, rebirth, and necessary endings or death. 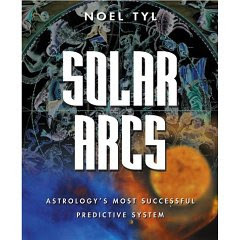 Nodal Axis solar arc may suggest important meetings, or connection with the public through work. It’s helpful to remember that not all of the solar arcs manifest as an observable change. In the next post we’ll discuss some practical considerations that modify our expectation with regards to transits and solar arcs.